I was first introduced to Italian Wedding Soup at Sebastiano’s, a delicious local restaurant in Toledo, Ohio. 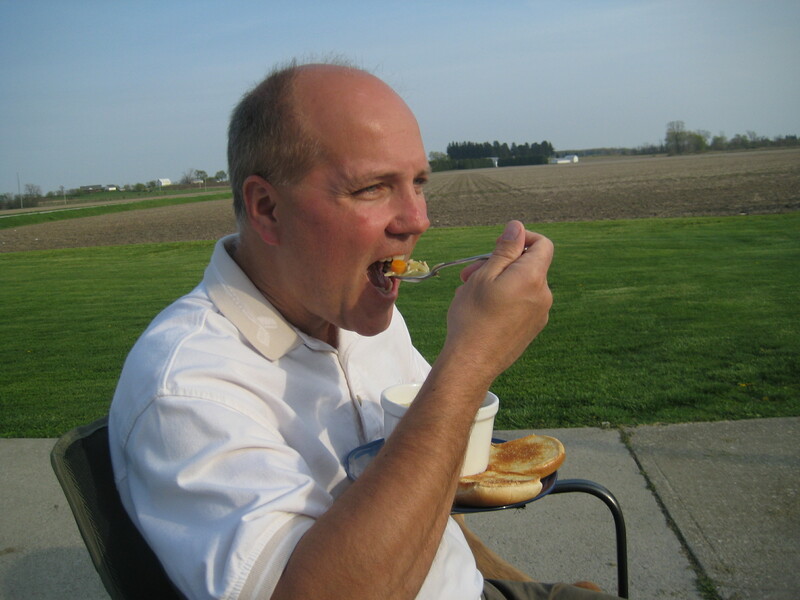 It was a huge step toward “adventuresome eating” for me back then, in my picky days. A step my stomach has oft thanked my brain for, if not my thighs. 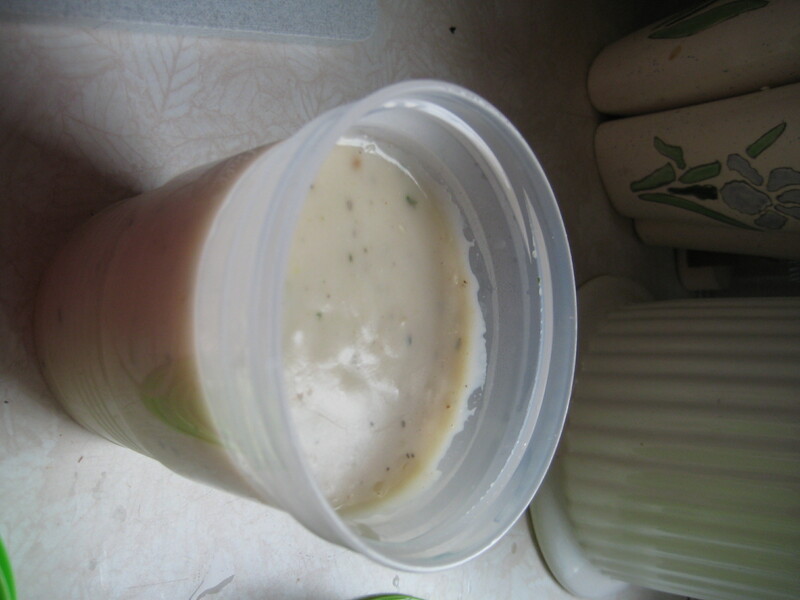 I had to have easier access to this soup from then on. 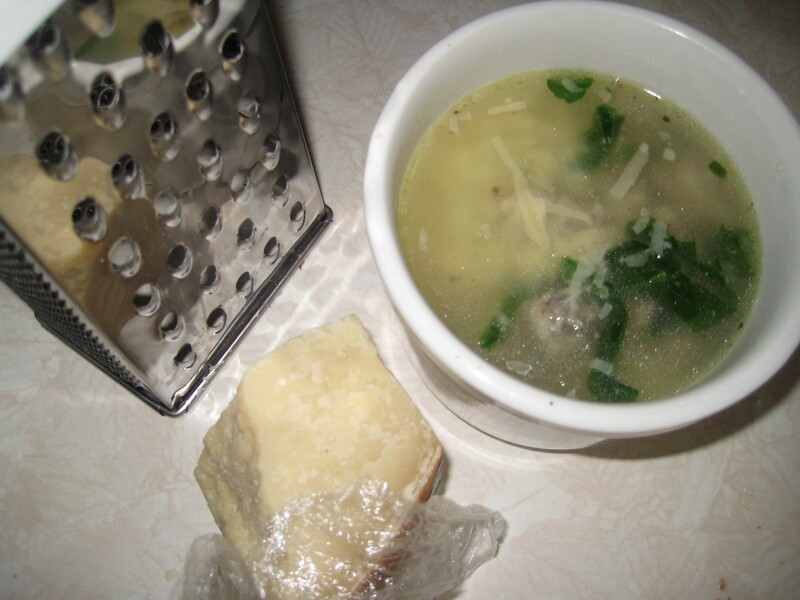 My first attempt at Italian Wedding Soup failed pretty miserably. Not only did my bland homemade meatballs cause my husband to put on his pretend “yummy!” face, but I also added beef broth where I should have added chicken. Yeah, it was bad. I tinkered with online recipes for awhile, coming close to Sebastiano’s delicious creation but gradually becoming weary of how time consuming it all was. And then I struck gold. Polish gold. It all began one steamy August day, where our thoughts and actions were consumed with the task of painting our massive giant deck on our previous house. We were preparing the house to sell it, and begged invited some good friends to come over and help us paint and simultaneously celebrate Ty’s birthday. If our charm and good looks didn’t convince them to come do manual labor, then the out-of-this-world amazing kielbasa from Stanley’s did! So we painted, cooked, laughed, and enjoyed each other. It’s amazing what kielbasa can get people to do! Stanley’s kielbasa from Toledo, Ohio, is hands-down, the best kielbasa ever. Don’t be intimidated by their location…it’s so worth it! Fortunately, we over-purchased kielbasa. I was faced with an unexpected challenge. 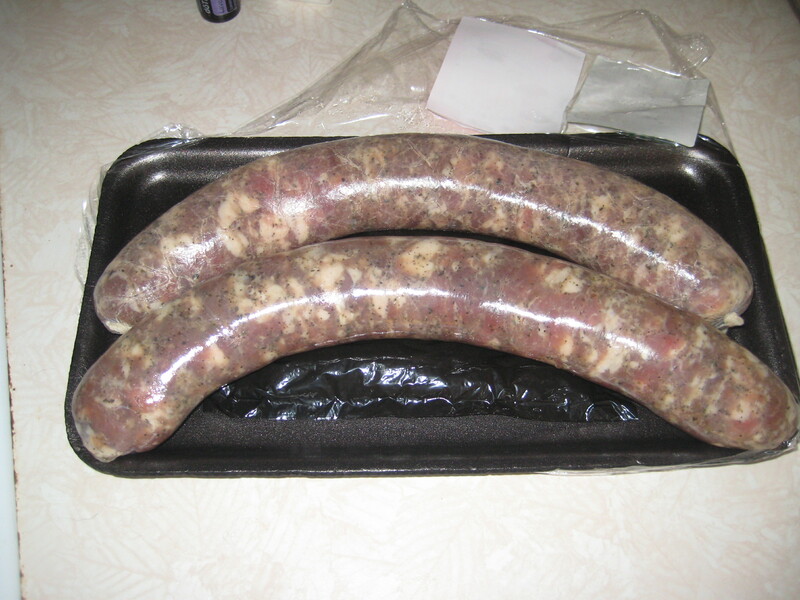 What to do with leftover kielbasa? Has such a thing ever happened before? Then it hit me: Soup. 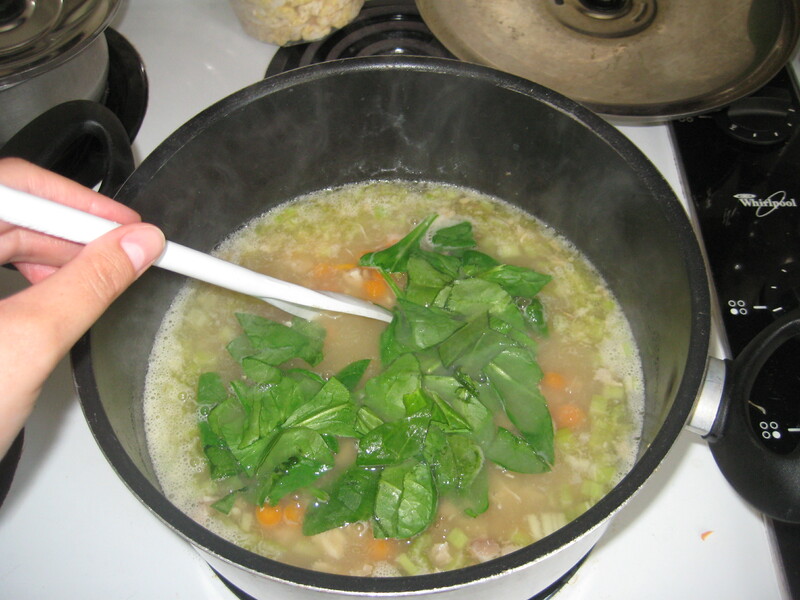 Wedding Soup. 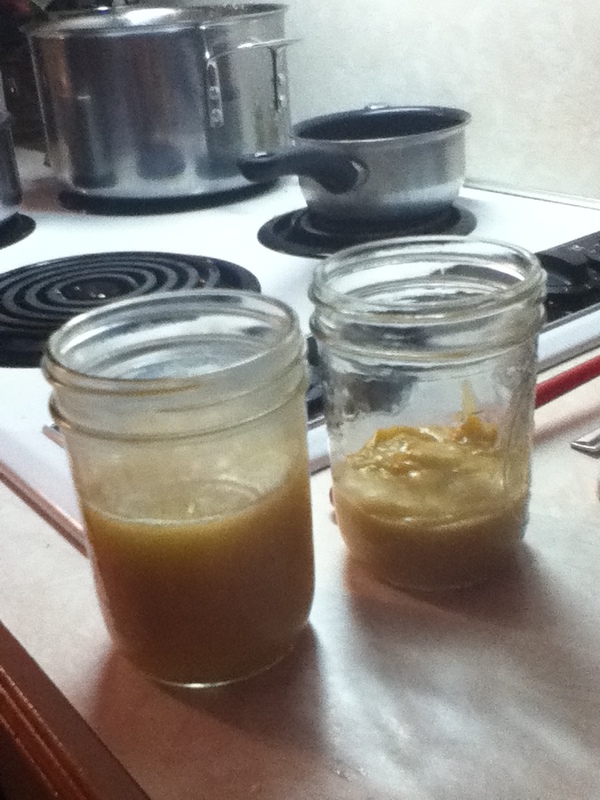 The first batch was good…REALLY good. I made it with spinach, because it was all I had, and because I didn’t know better. 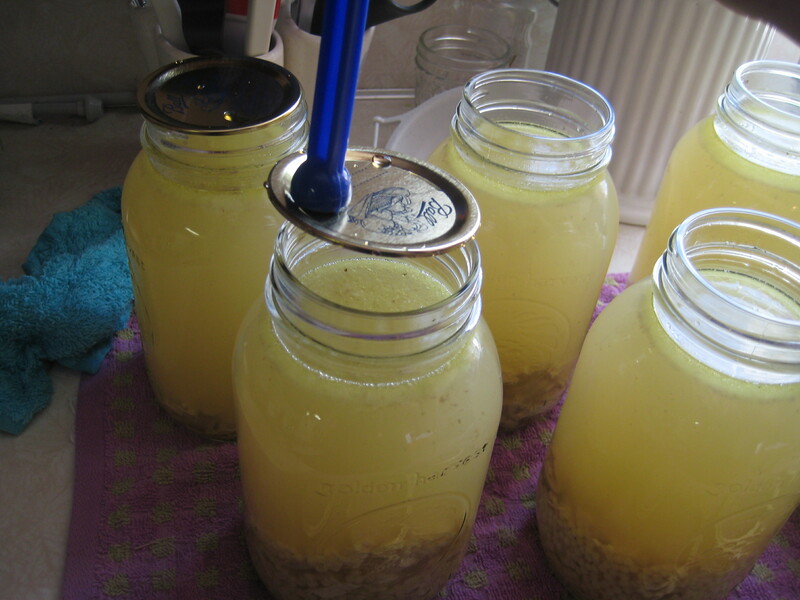 The second batch was epic. I made it with arugula this time, and ever since then it has earned it’s place in my freezer as a go-to meal for chilly nights. Or steamy August nights, if the taste buds demand it. 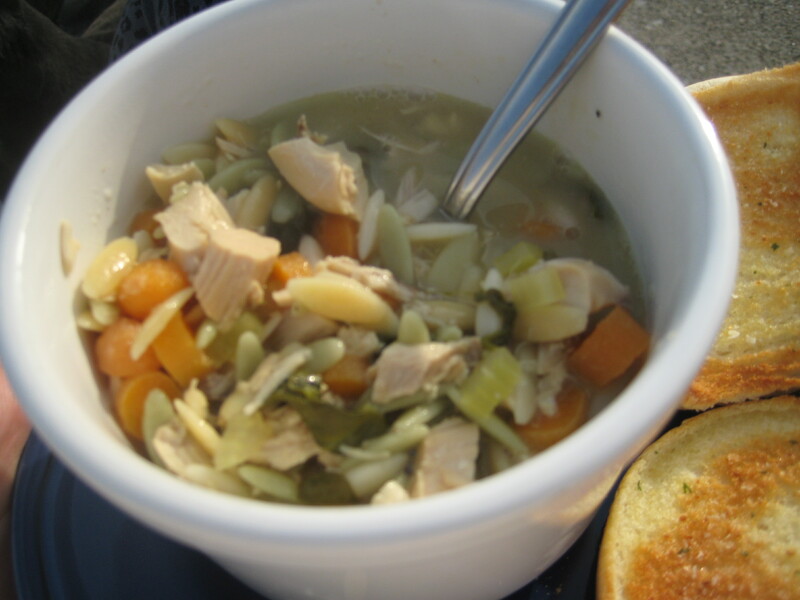 The best part is, you won’t believe how easy this soup is. However, since we’re borrowing the main ingredient from Poland, I don’t think we can truly call it “Italian Wedding Soup”. 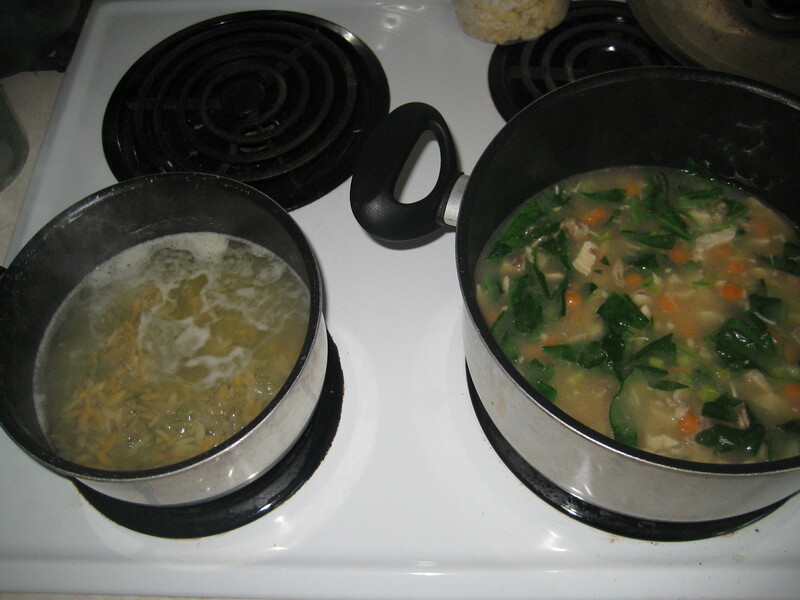 (Can we call it “Chelsea’s Wedding Soup? 🙂 ) But since I insist that you use Acini de Pepe noodles, you can’t really call it “Polish Wedding Soup” either. So let’s call it what it is, a beautifully blended mix of history, ethnicity, and love from the kitchen. 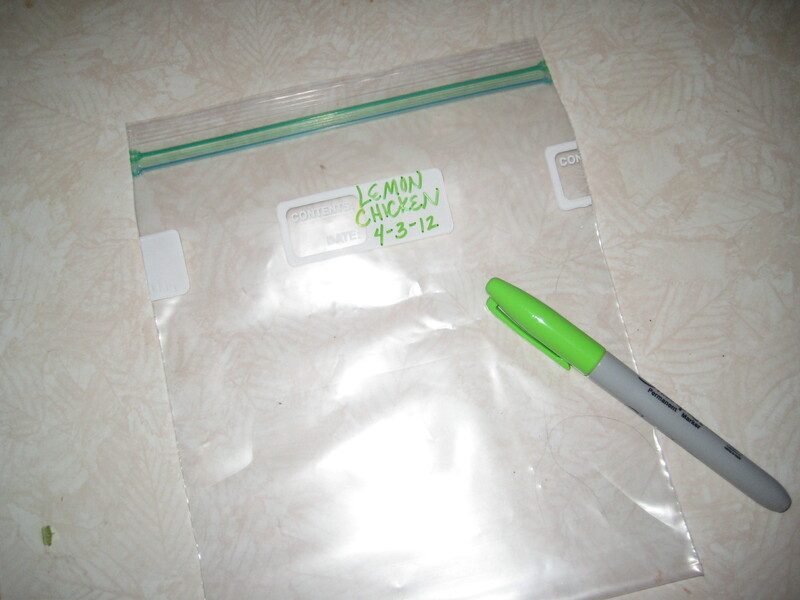 1tsp chicken base – also optional, but I always use it. fresh Parmesan – not really optional. You’ll want it. 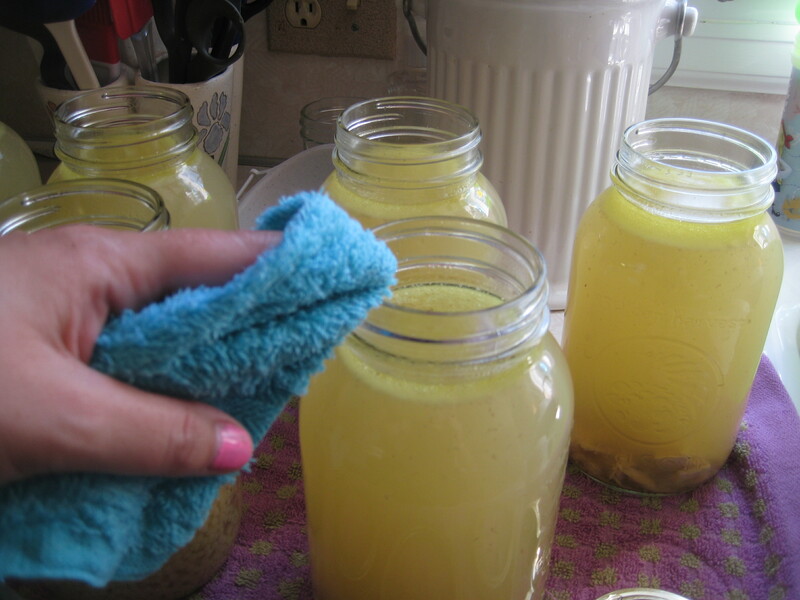 Fill a large stock pot (4-6 quart size) with your chicken stock. 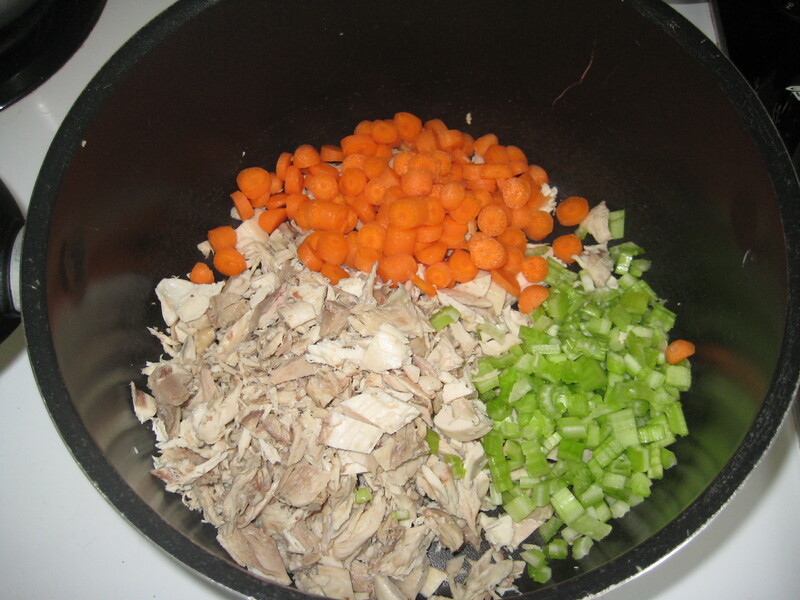 Place the onion, carrots, celery and uncooked kielbasa in the broth and bring to a boil. It’s okay if there’s still some pink, it’s going to finish cooking in the pot. 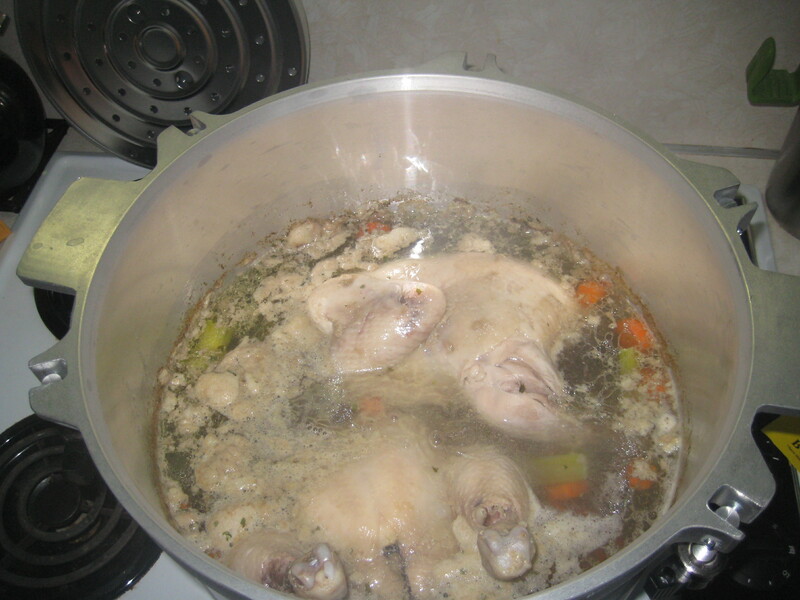 Return to broth. 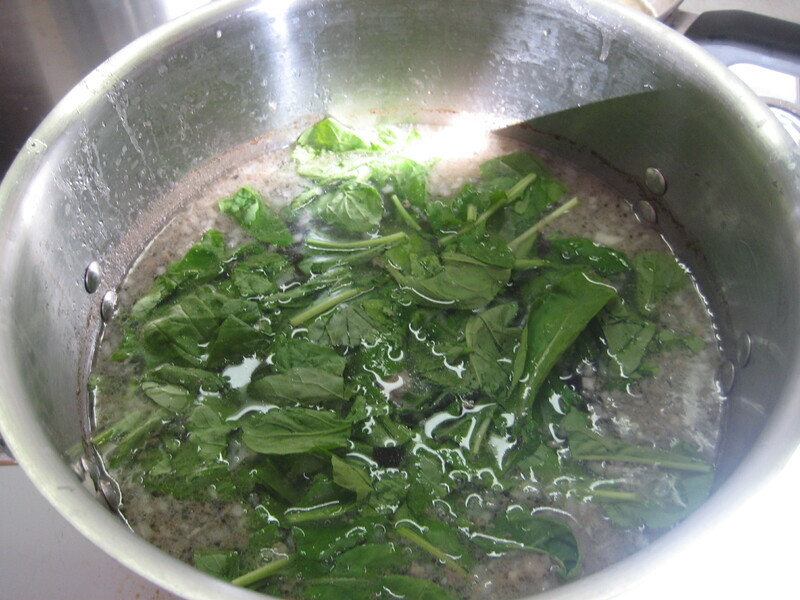 Tear arugula in halves or quarters and add to broth, bringing broth back to a low boil. 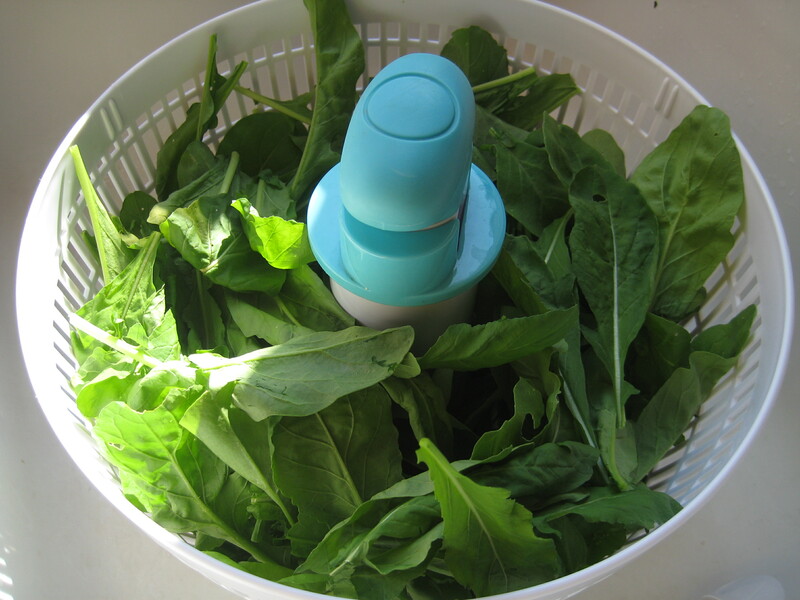 When the arugula is no longer bright green and looks somewhat wilted, add drained pasta. 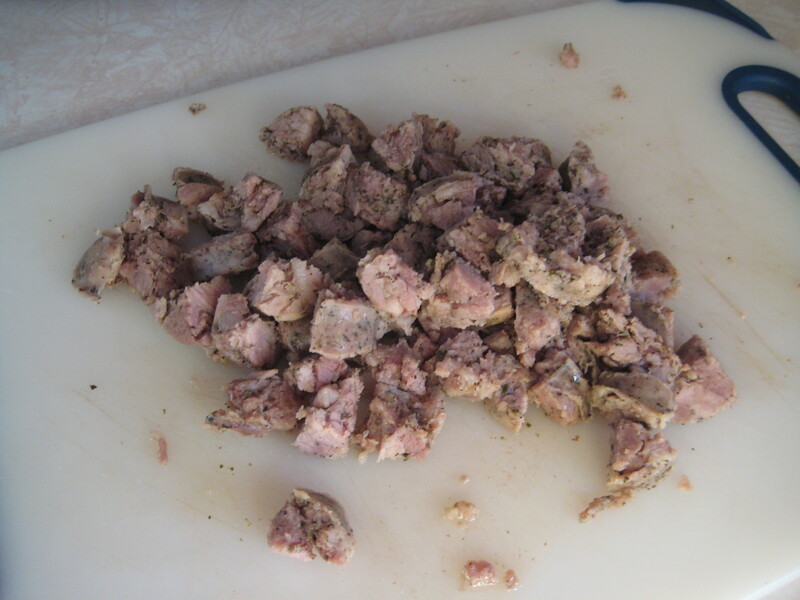 Boil for 3 more minutes or so, check some of the kielbasa chunks to make sure they are cooked through. 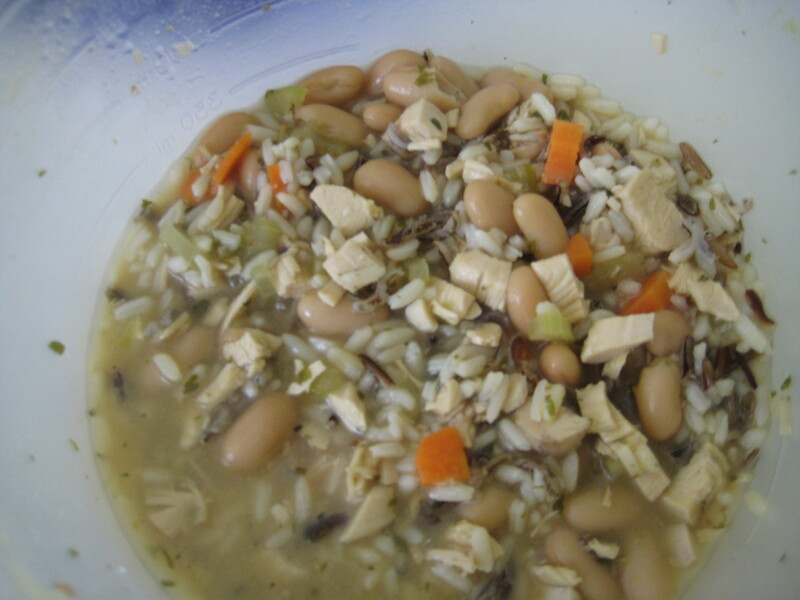 Taste test: if it’s still slightly bland, add some chicken base until it reaches the appropriate level of saltiness. Then serve! Top with freshly grated Parmesan cheese for an added Wow! It may not be authentic, but it’s authentically good. Man, that was cheesy. Good thing I like cheese! P.S. 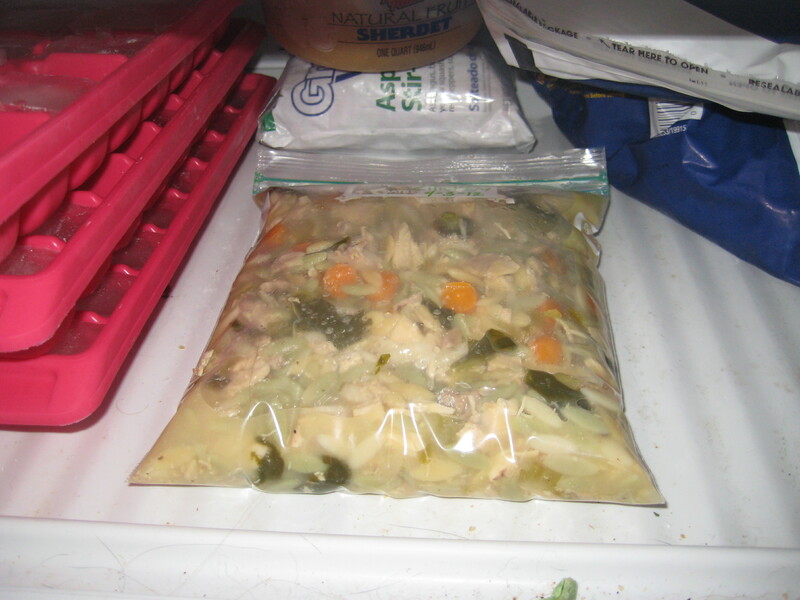 You can freeze this soup nicely, even with the noodles in it, although admittedly it’s always better to add the noodles fresh. P.P.S. If you’ve never been to Sebastiano’s, then you haven’t lived. There isn’t a bad thing on the menu! 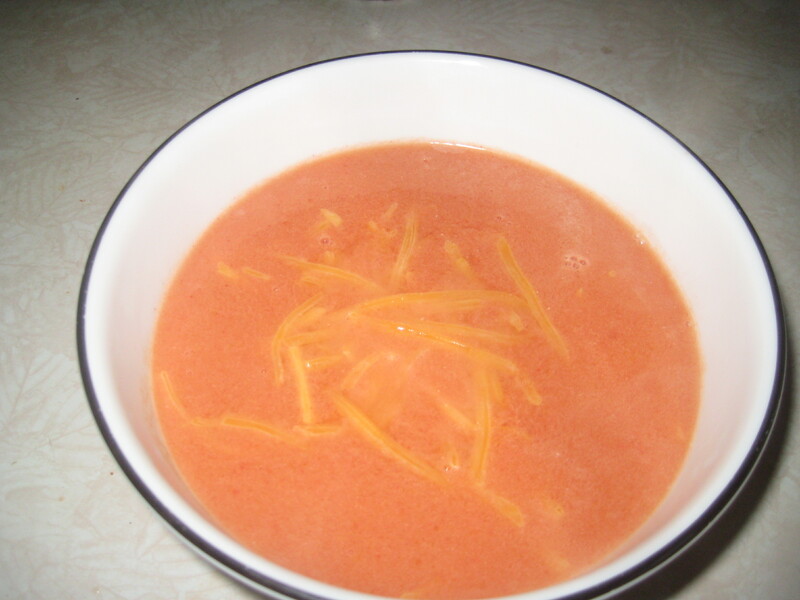 I’ve never made my own tomato soup before. 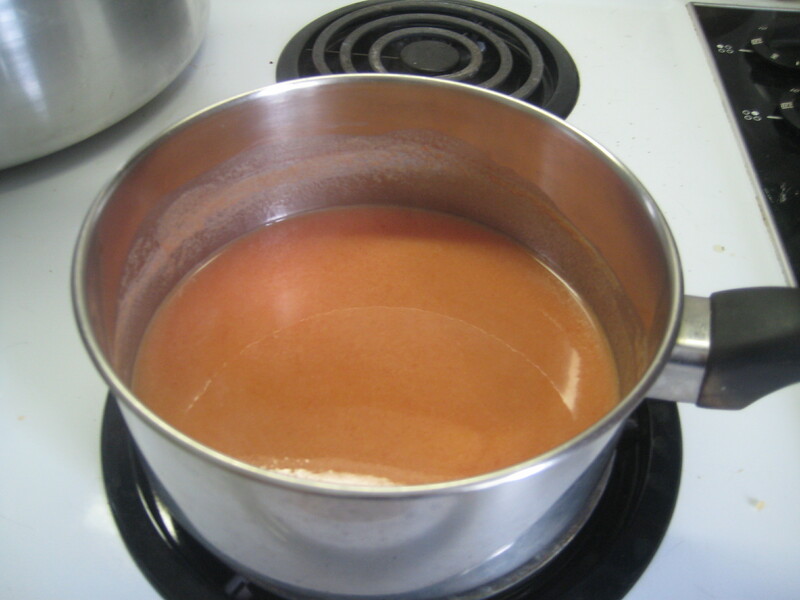 I have, however, consumed approximately 8,000,000 cans of tomato soup over the last 2, almost 3 decades. I’m sure that’s not much of an exaggeration, either. 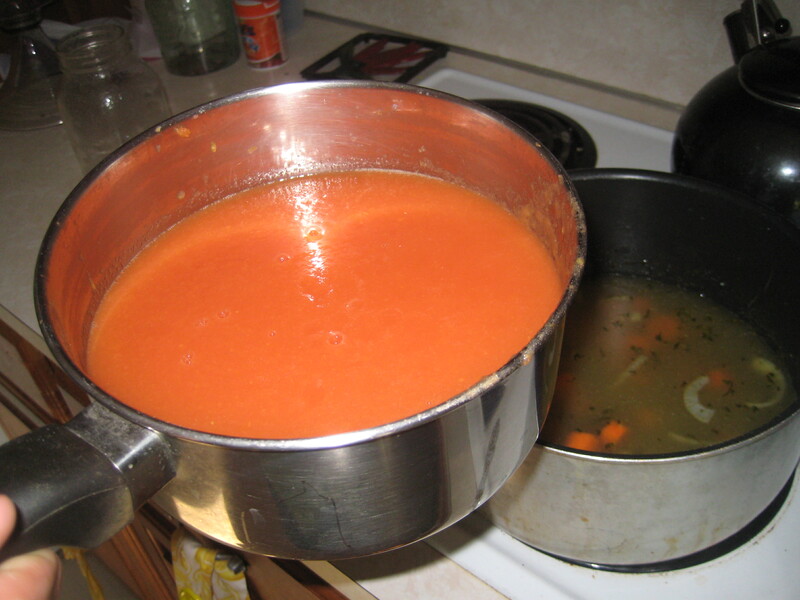 It’s kind of ironic how much I love tomato soup and all tomato products because until recently, I wouldn’t touch a raw tomato with a 10-foot pole. I’ve since matured drastically in a culinary sense (I’ve even started eating mushrooms! Gasp!) 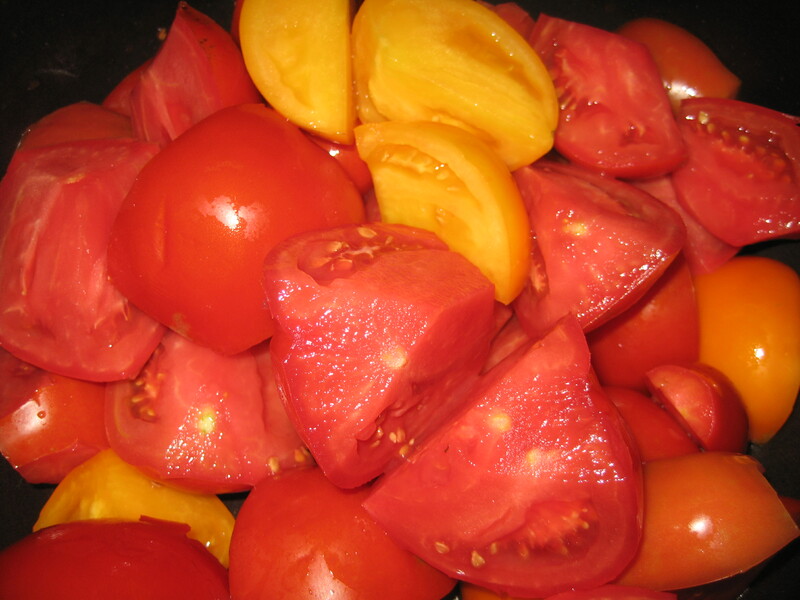 and no longer sneer at tomatoes, even gone as far as ceasing to pick them off of menu items. 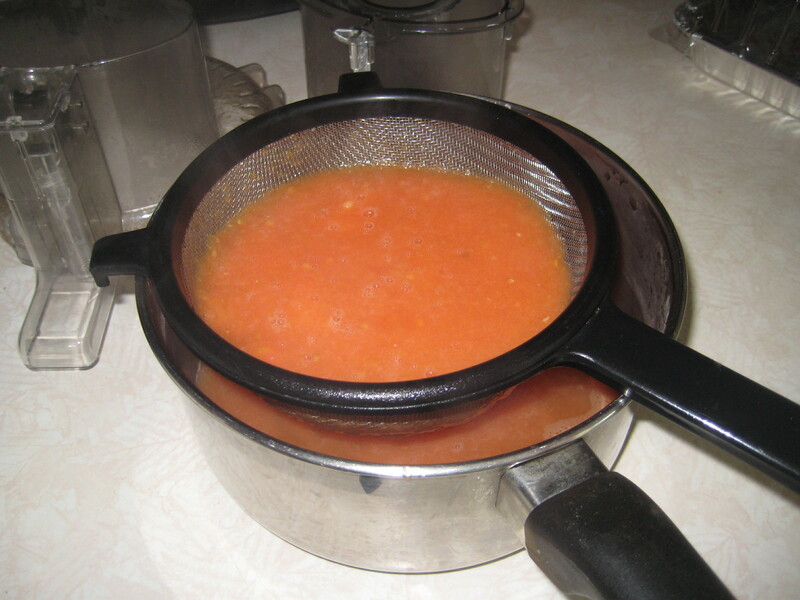 So lately it’s occurred to me that it’s high time to finally make my own tomato soup, for once and for all. 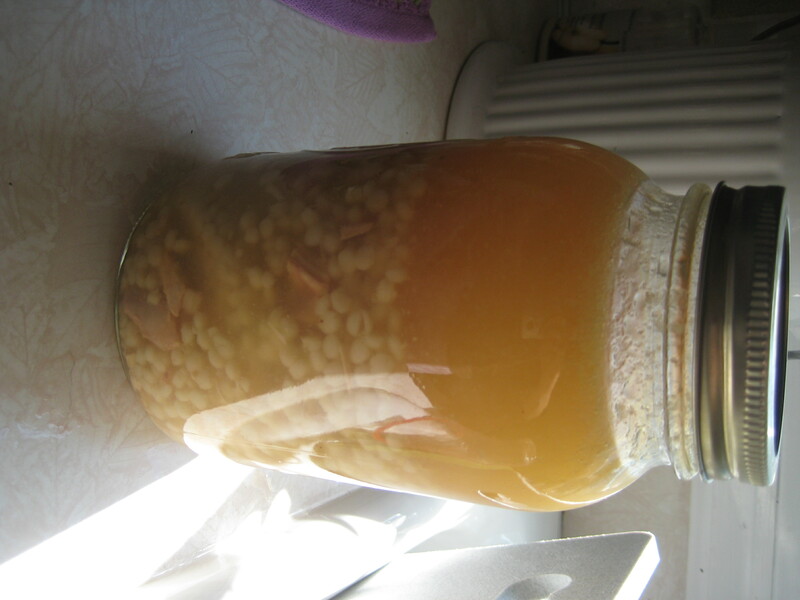 Are you starting to worry that this is becoming more of a blog on soup than it is on preserving? Me too. I have an addiction! But in my defense, it was a pretty crappy day. No sun in sight. 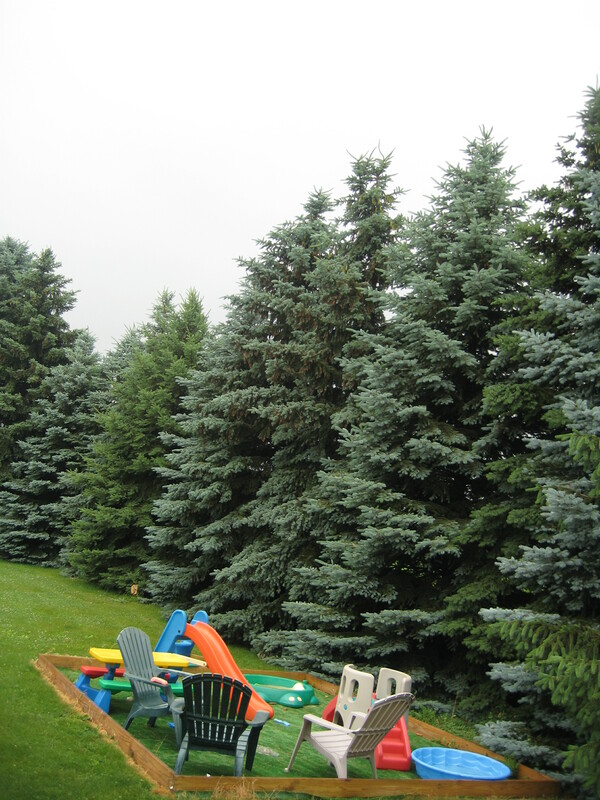 Rain, dreariness, inside activities. All signs that point toward soup. Okay, here’s the scoop: Everyone has a thing, right? 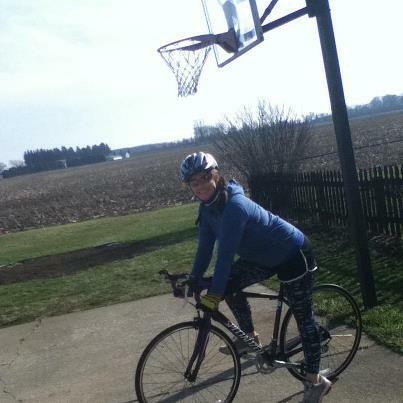 Well, I go in phases. I guess you could even say phases are my thing. 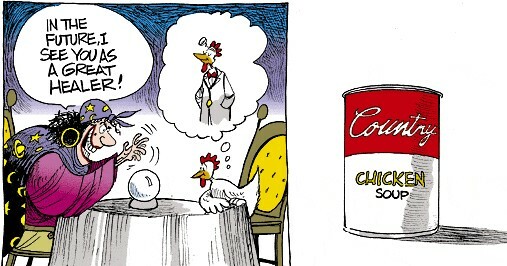 The phase I’m going through right now is that commercially canned foods are from the devil because of BPA, even though I’m not even entirely sure what BPA is or why it’s from the devil. (You can read the link, but if you’re like me all you’ll get from that is “don’t eat it, it’s from the devil”) But whatever, that’s my thing. So anyway, the point of telling you that is because I had a really hard time finding tomato soup recipes that were truly from scratch. 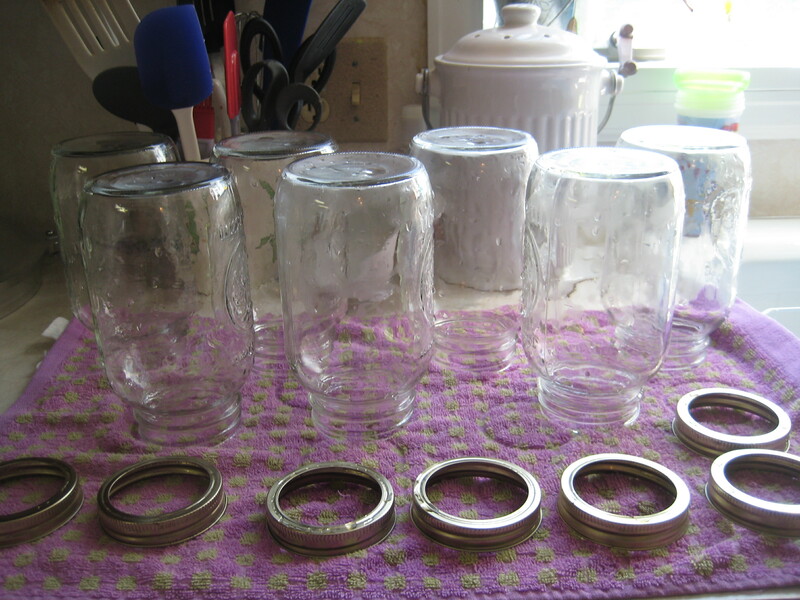 They all used canned tomatoes, which are apparently some of the worst offenders for the whole BPA thing, so obviously I don’t want to use them. 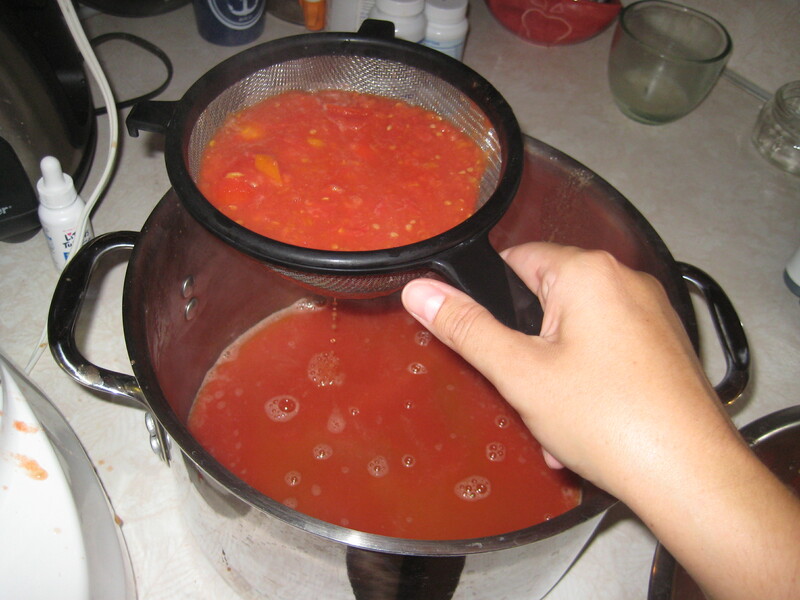 So here’s a quick tutorial on making tomato sauce. We’ll revisit this in about a month when the tomatoes are in season, but they’re pretty cheap in the stores right now anyway, so maybe this is useful information now! 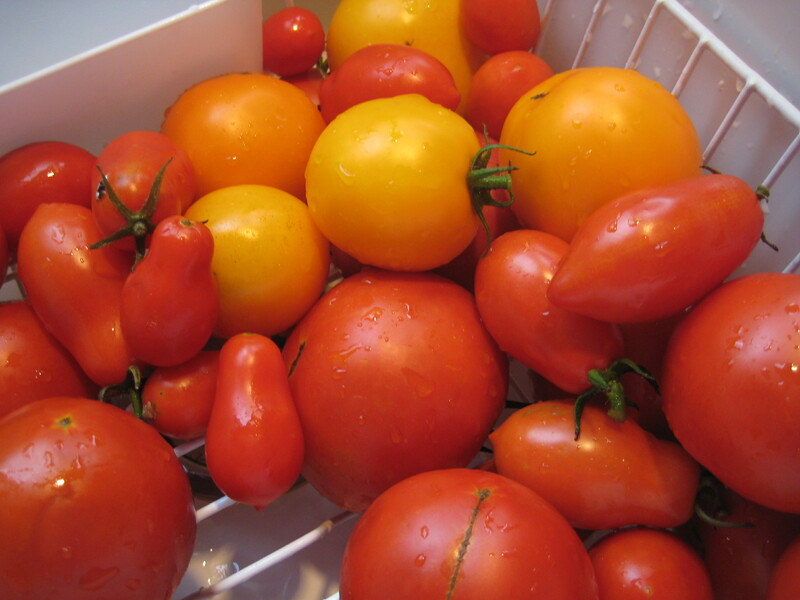 The first step is to wash the tomatoes. 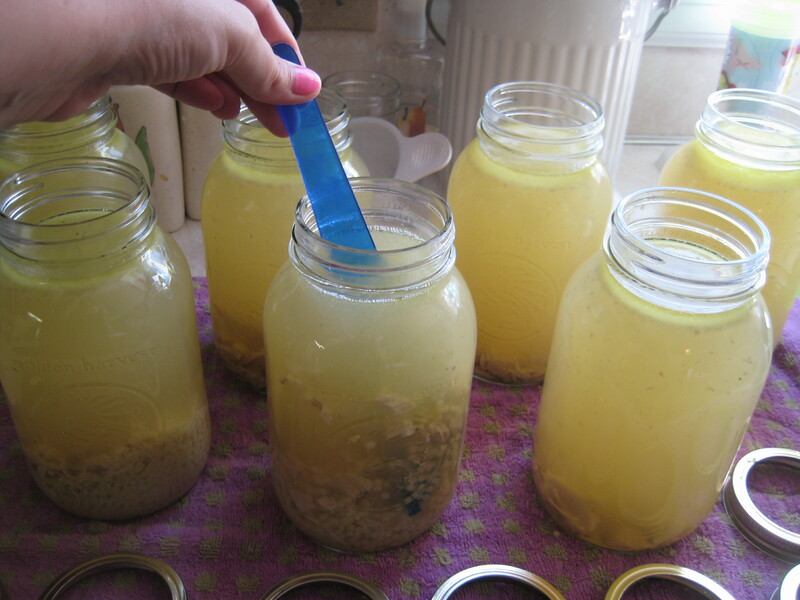 Next, we’re going to blanch them to remove the peels easier. 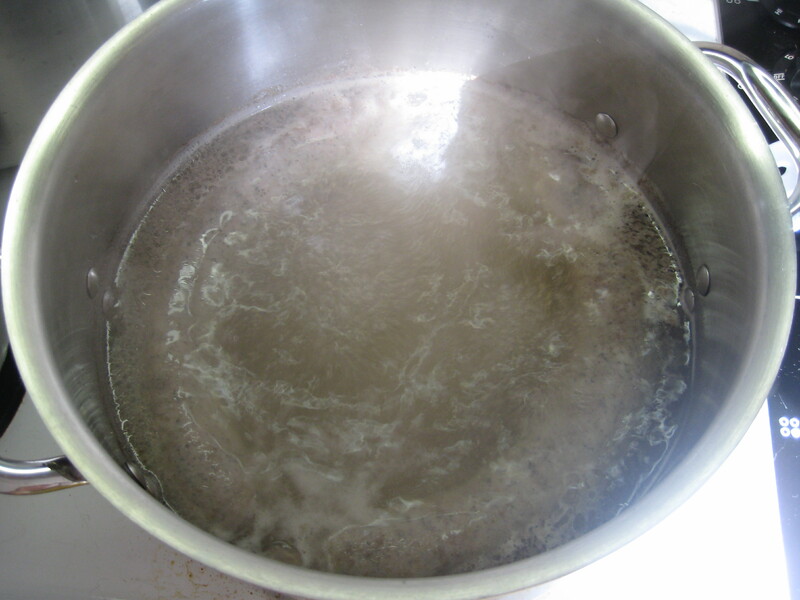 You do this by bringing a pot of water to a boil. 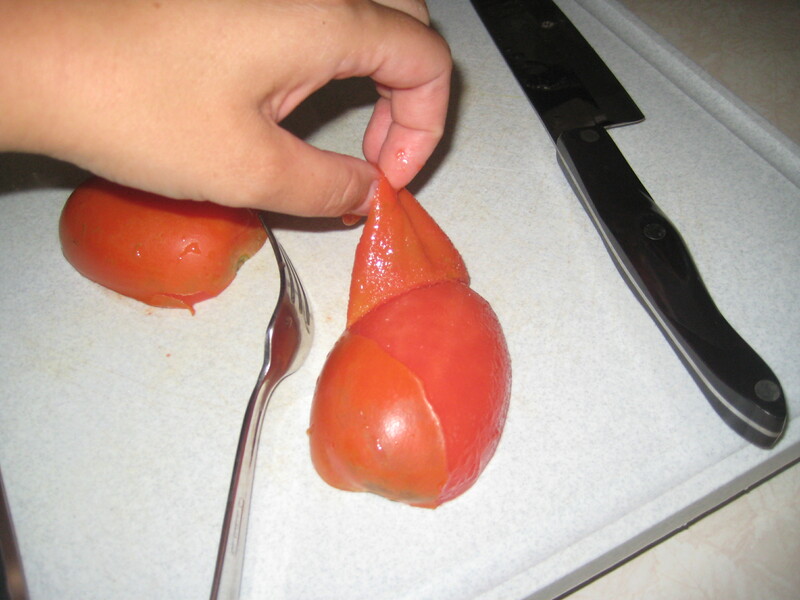 For the larger tomatoes, you might want to cut them in half, but it’s not necessary. Just a little easier. 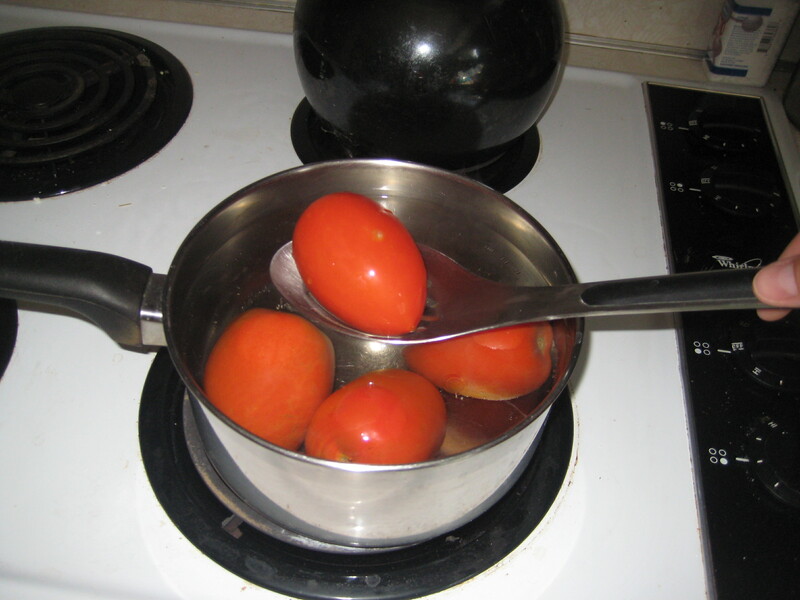 Once the water is boiling, you carefully place the tomatoes in the water for about 30 seconds to 1 minute. Then remove them, and with a tongs or a fork, peel the skin away. It should peel away without much effort. 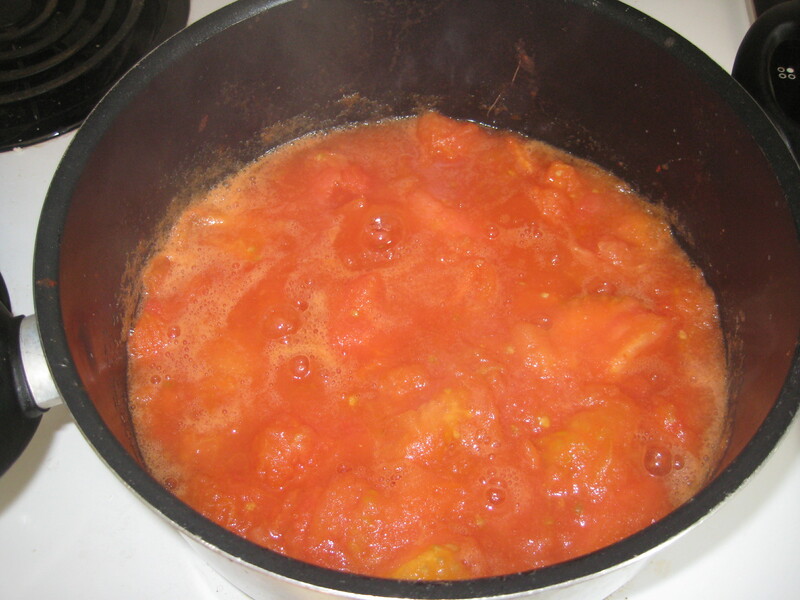 If it’s still sticking, return the tomato to the boiling water for another 30 seconds. 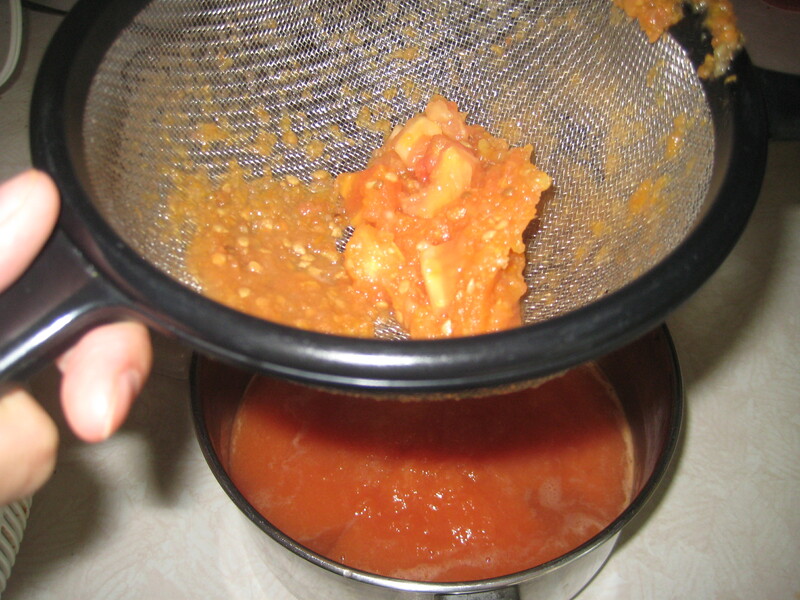 You can technically skip this step since we’re going to strain the tomatoes anyway, but I think it makes straining so much easier to get rid of the peels first. 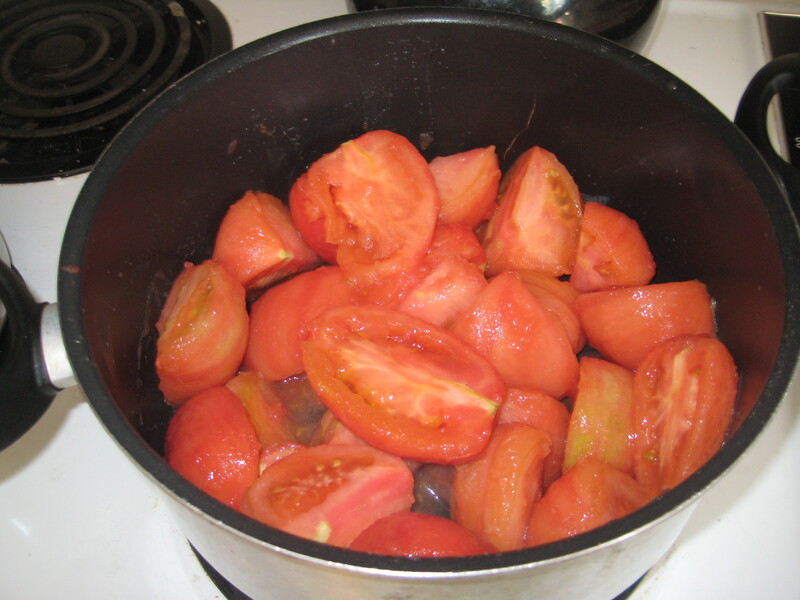 Next, empty the water from the pan, cut up the tomatoes into halves or quarters and return them to the empty pan. 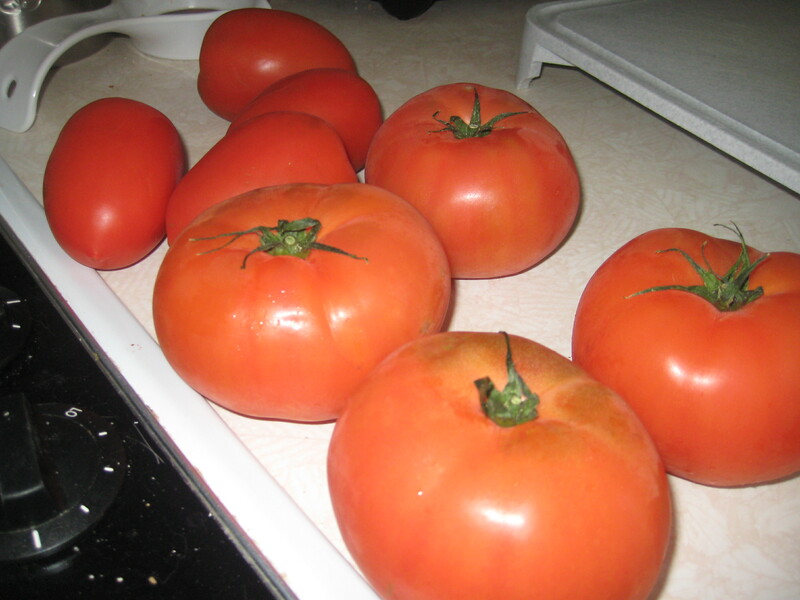 This is when I start salivating, and my husband – who worked in a tomato factory as a teen – leaves the house. 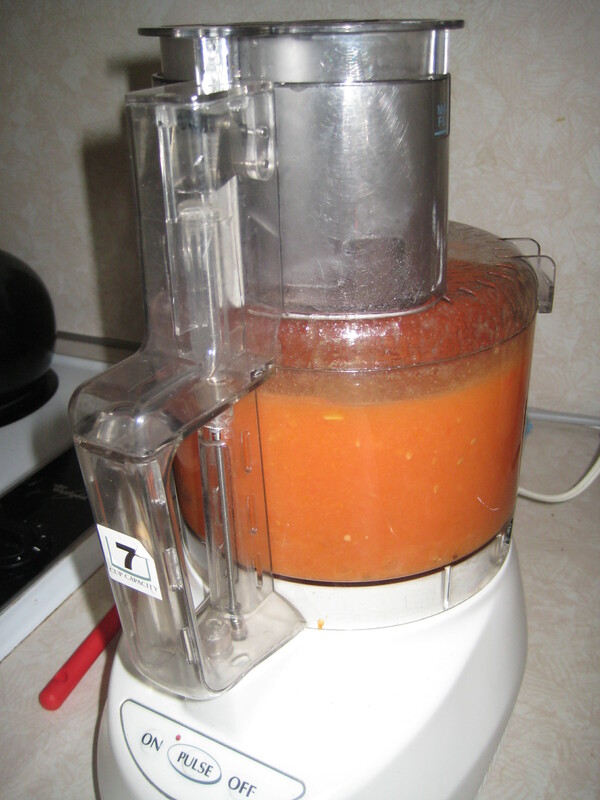 Once the tomatoes have boiled down to a chunky sauce, turn the heat off and bring out the food processor. 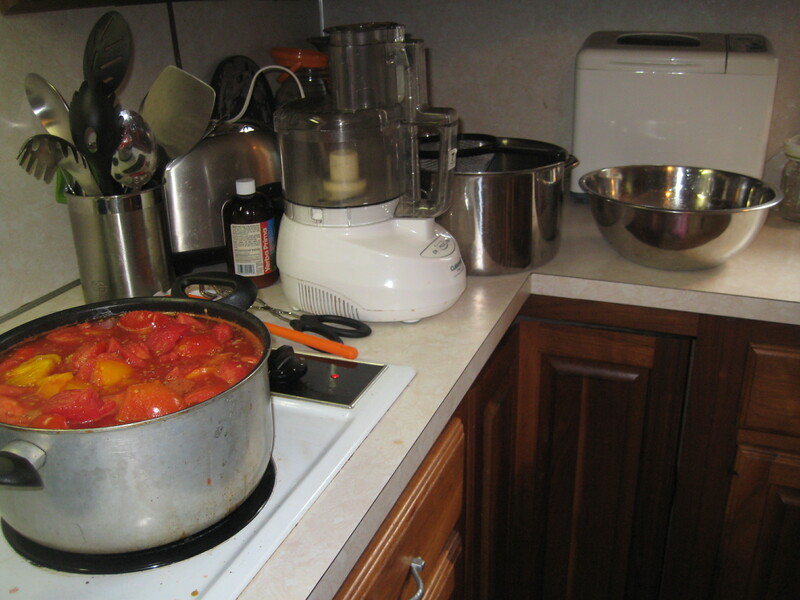 Load up the food processor and puree the tomatoes. 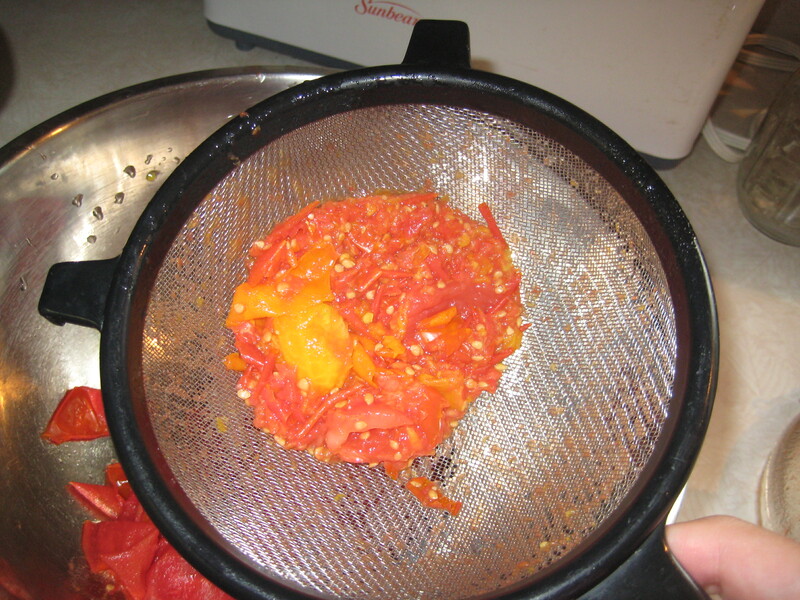 Depending on the size of your processor, you may need empty and re-load to process all the tomatoes. Now it’s time to strain out the seeds! The best way I’ve found to do this is by using a strainer. 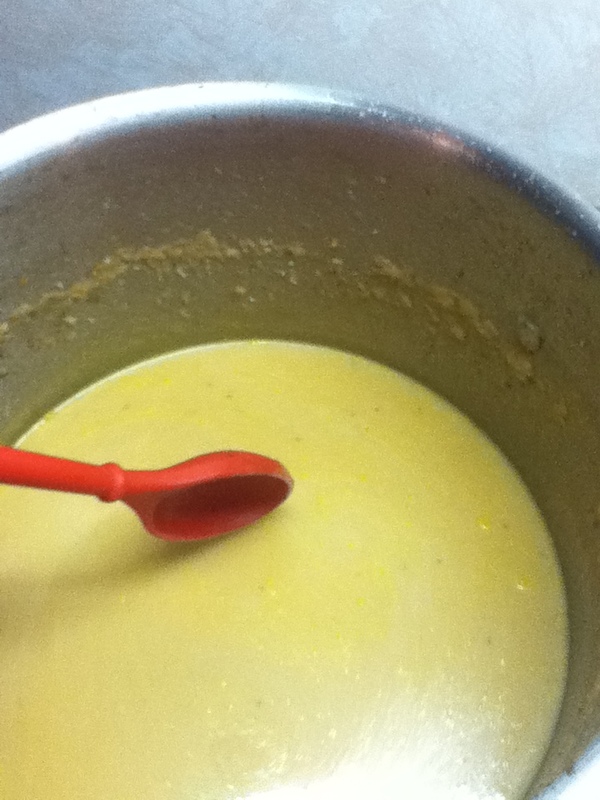 (Go figure) Ladle one or two scoops of puree at a time into the strainer, and hold over an empty bowl or pan. 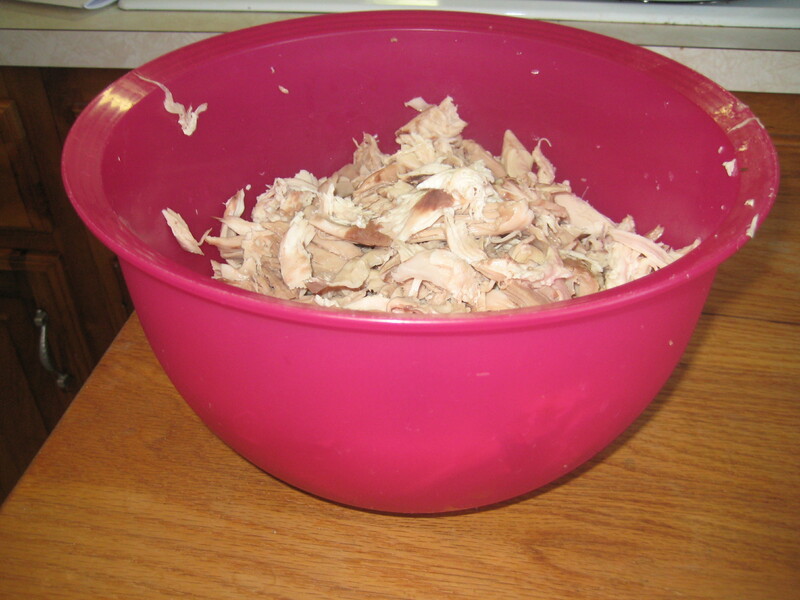 BANG the strainer on the bowl to get all the “meat” through. 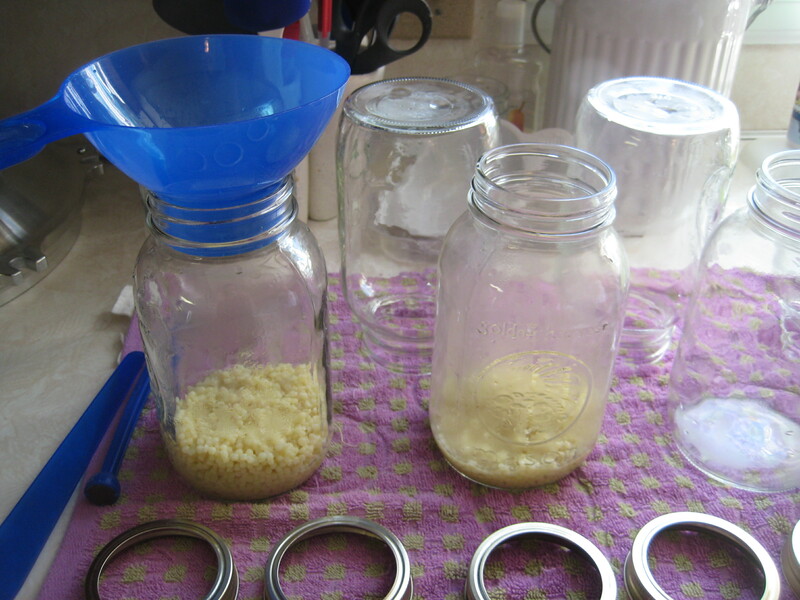 This is much faster and more effective than pressing the puree with a spoon. It does make a little bit of a mess, but that’s what the sponge is for! 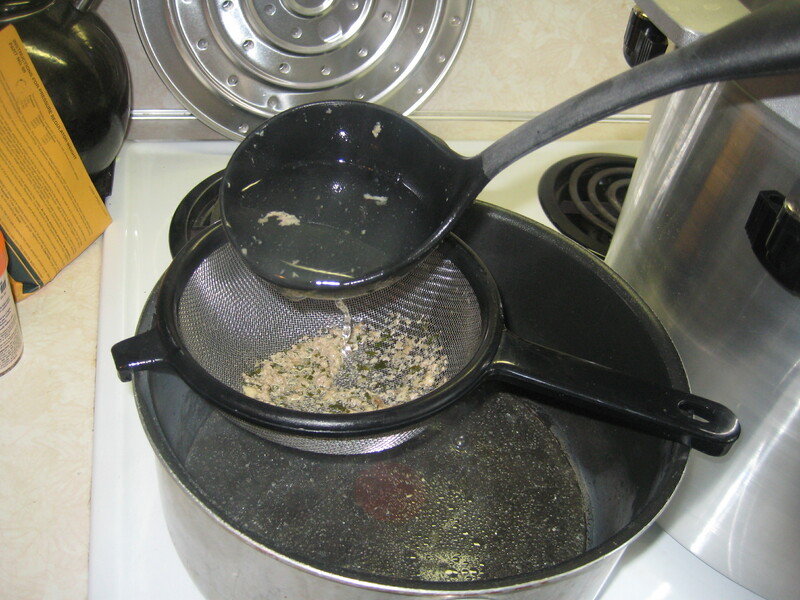 Just the seeds and whatever didn’t boil down is left! All the good saucy meat made it through! 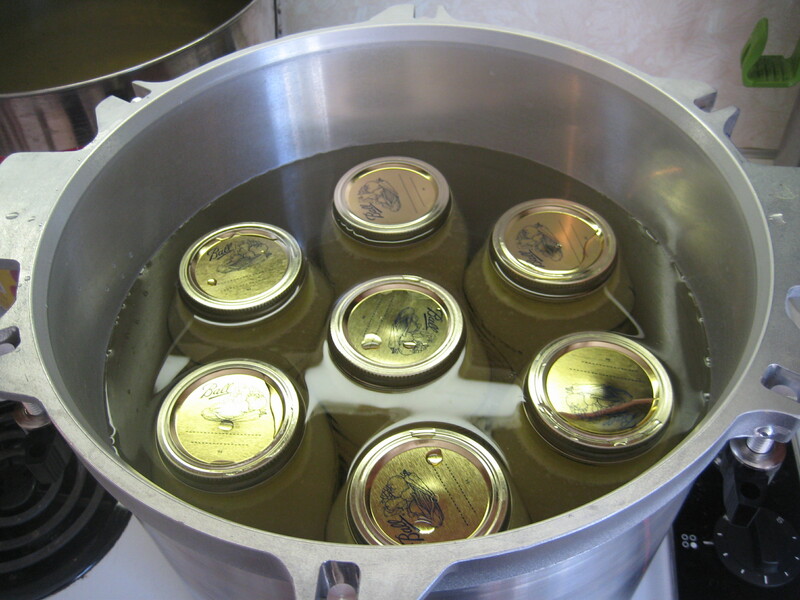 Once you’ve done this to all of the puree, return the sauce to the stove and bring to a boil. 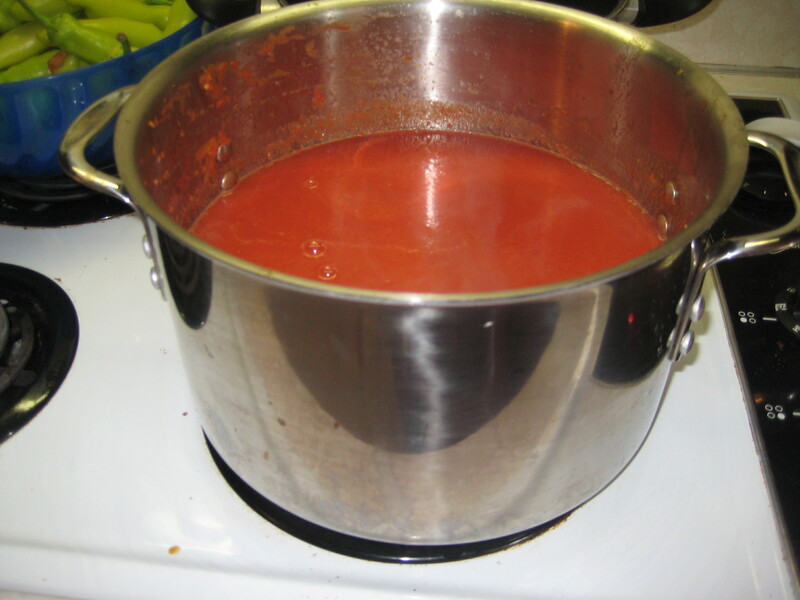 Now, from this point, if you just want sauce, you’ll bring to a boil, reduce to a simmer for about an hour until the sauce is the consistency you prefer. 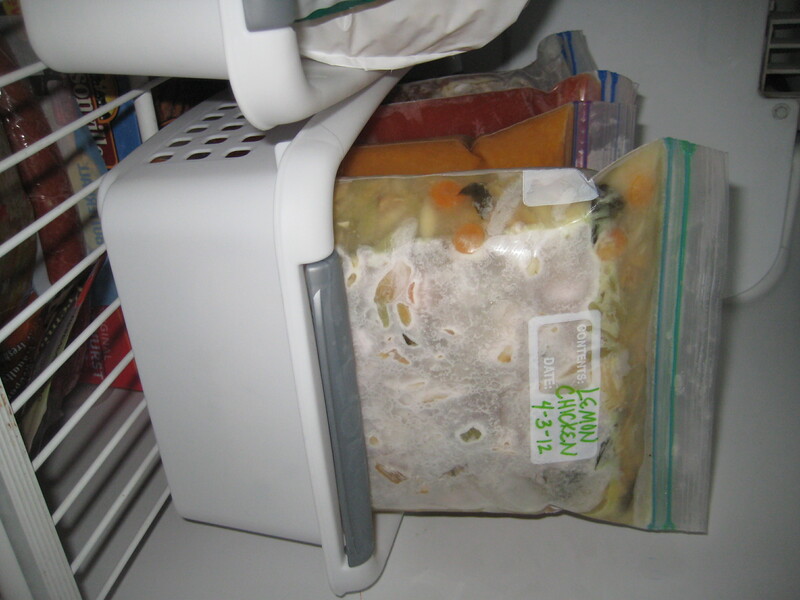 From here you could can the sauce or freeze if you aren’t going to immediately use it. 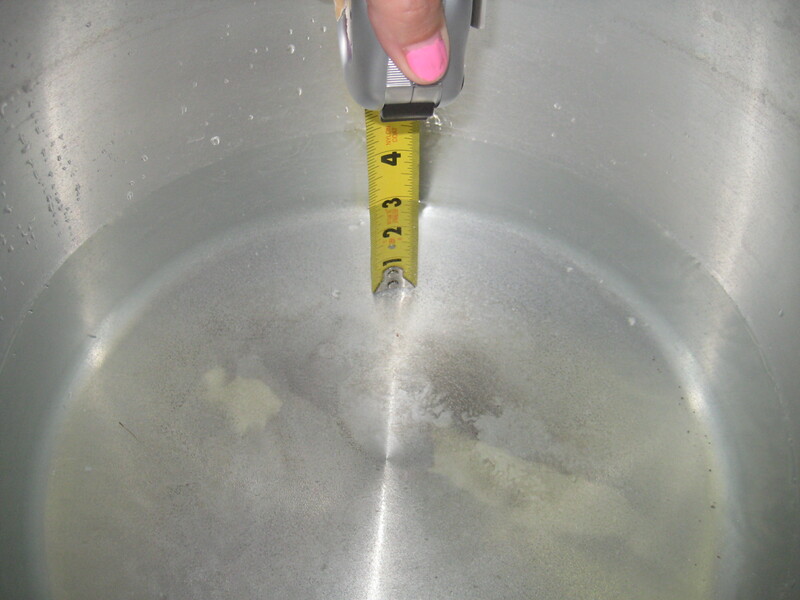 But since we are going to immediately use it, go ahead and let it simmer down for 30 minutes or so, or until it’s thicker than a soup consistency. 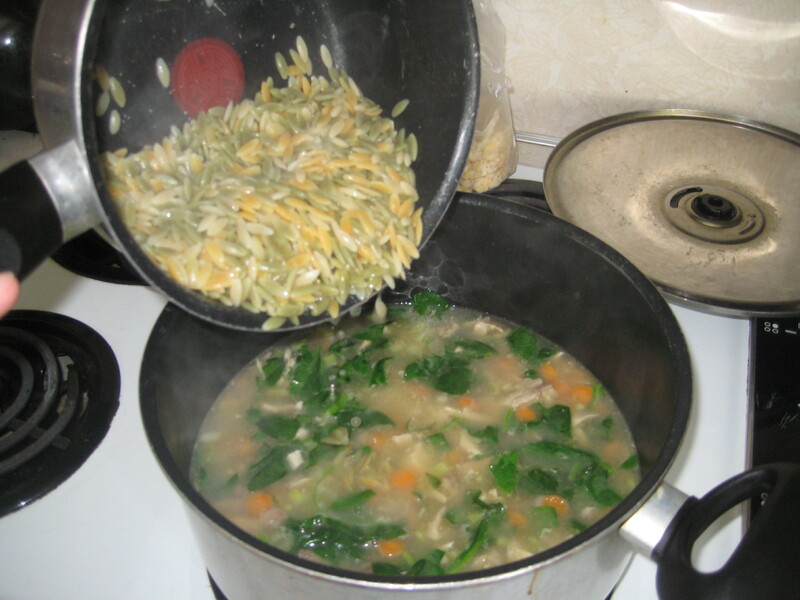 Now we make soup! 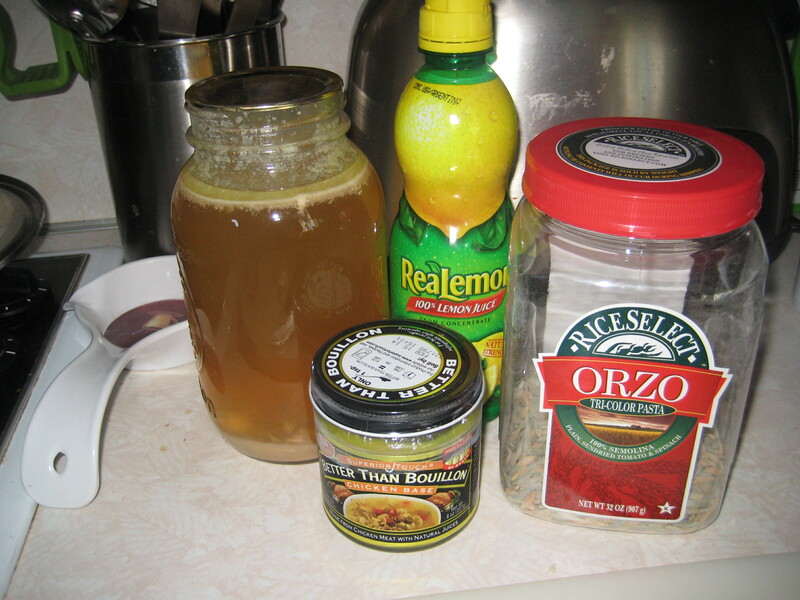 I used this recipe for the base of my soup. 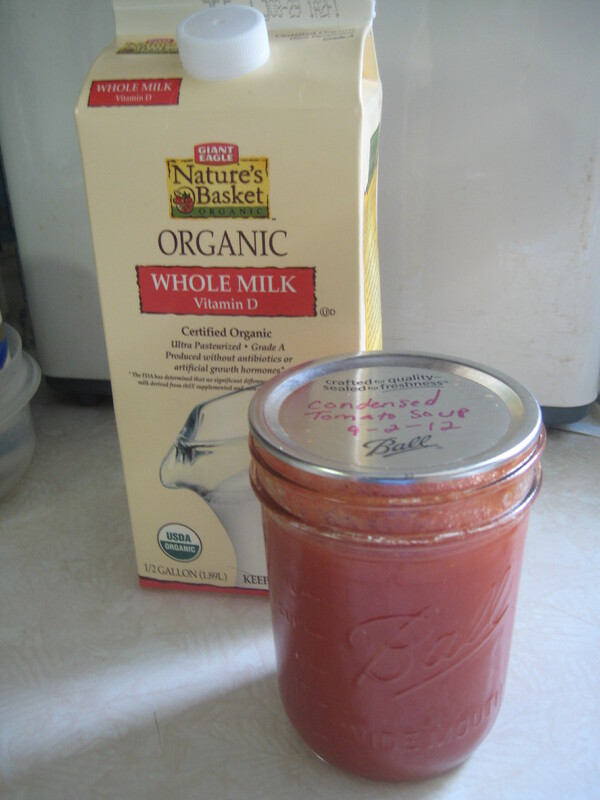 This Recipe for Tomato Basil Soup, substituting homemade tomato sauce for the cans of tomatoes. Follow the directions from the above link, substituting the tomato sauce for the cans of tomatoes. Add the cheese to the soup at the very end while the soup is simmering hot and allow it to completely melt and become one with the soup. 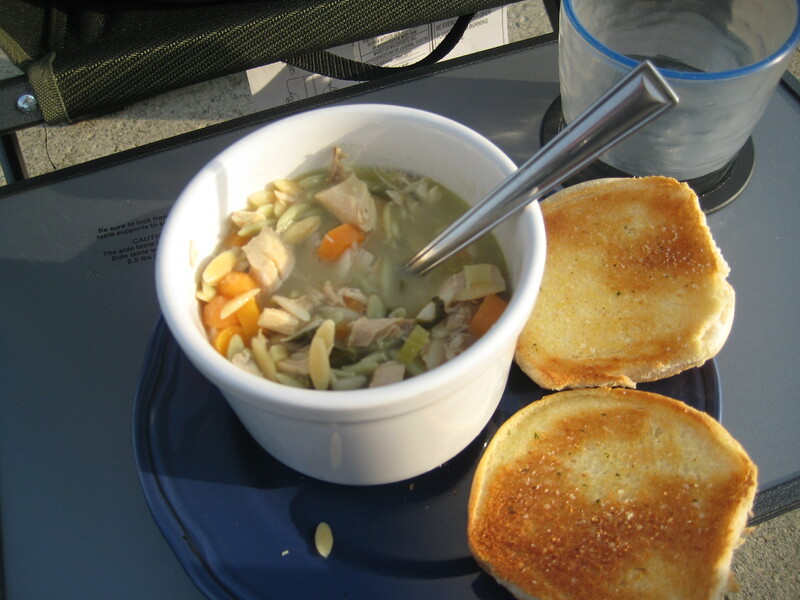 It really adds a heartiness and amps up the “comfort” level (aka, calories…) of the soup! 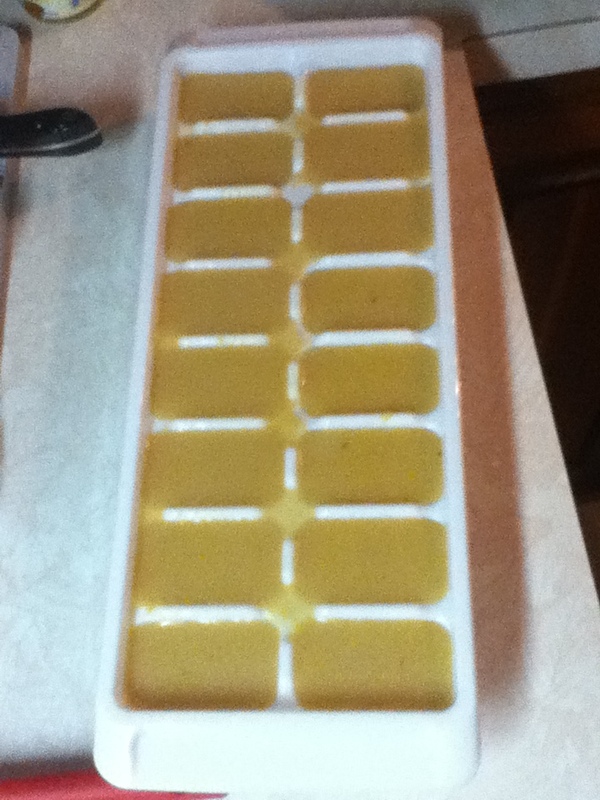 It turned out really good, although in typical Chelsea fashion it was a little trial by error. I started with only about a pint of sauce so it wasn’t a rich enough “tomato” flavor for me, but once I added more sauce I liked it. You can skip my sauce and just make it with cans of devil tomatoes like the recipe calls for, which is probably more accurate than my rendition. We got several meals out of this! The first meal was served with a hunk of homemade bread (which I almost burned, but still turned out pretty good), another meal was served with lemon cream pasta (which I added sauteed garlic too…a must! 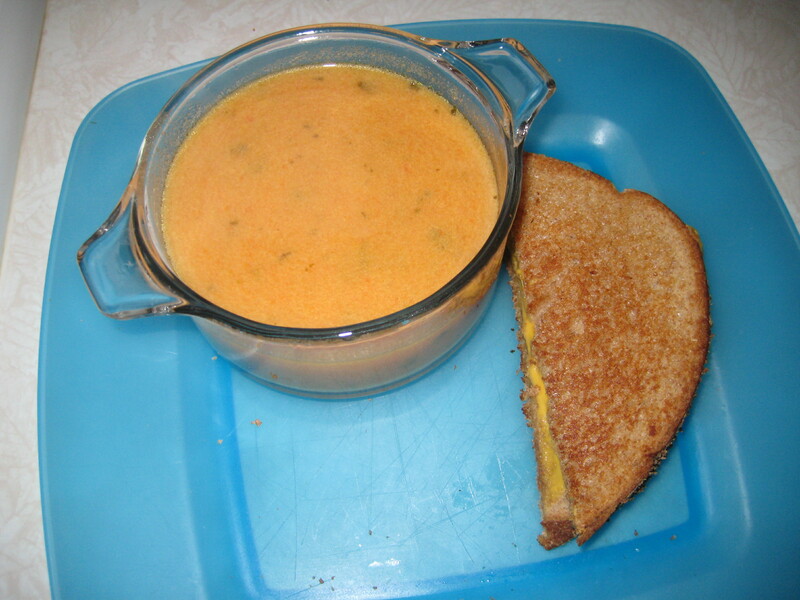 ), and the last meal was served on this rainy June day with…duh…grilled cheese! 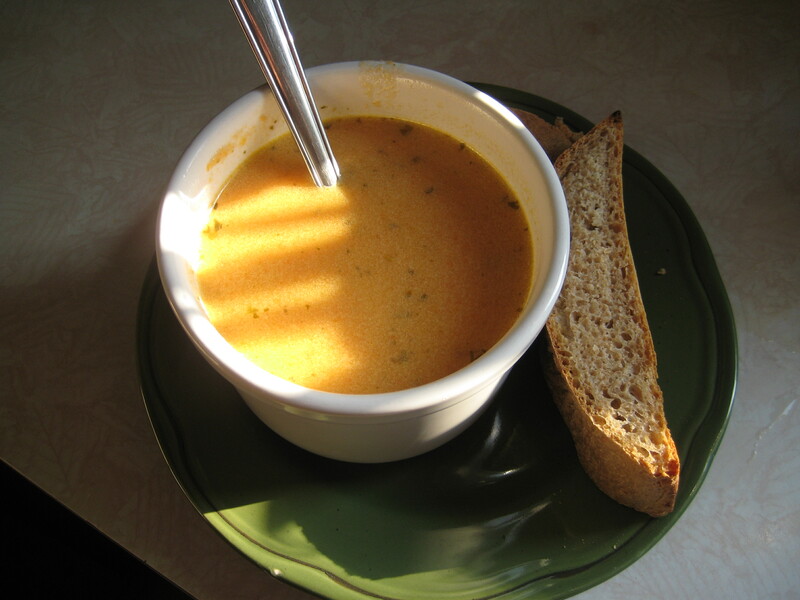 As I was making grilled cheese I got feisty and threw some cheddar into the soup as it was heating up (Ok, I’m lying. It wasn’t cheddar. It was fake plastic American cheese. Also from the devil, but somehow not a part of my current thing.) and that made all the difference in the world! Now imagine if I had used real cheddar! That didn’t surprise my husband at all when I did that because I’m well known for adding half a block of shredded cheese to my tomato soup. 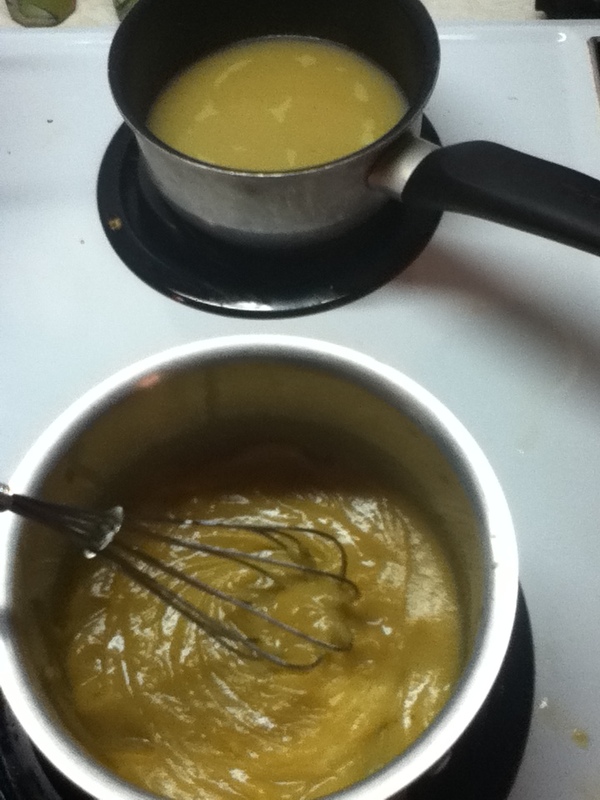 So rather than make you discover this happy pairing by perchance, I figured I’d just add it to the recipe. Oh yeah! 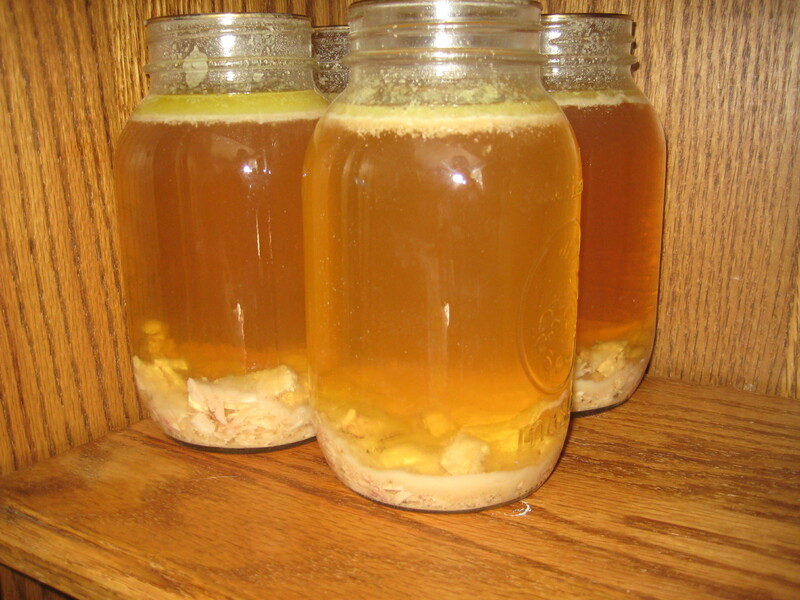 This is a food preservation blog… I keep getting distracted by recipes and the actual consuming of the food! If you want to make up a bunch and pressure-can it, do not add the cream. That has to be added as you heat it because it’s not recommended to can dairy. 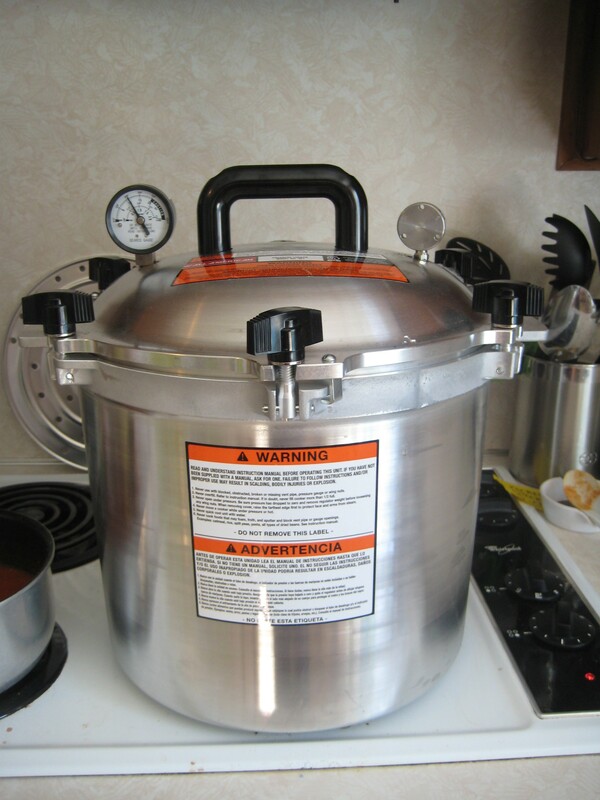 If you choose to can this soup, process quarts at 10 lbs pressure for 30 minutes and pints for 25 minutes. 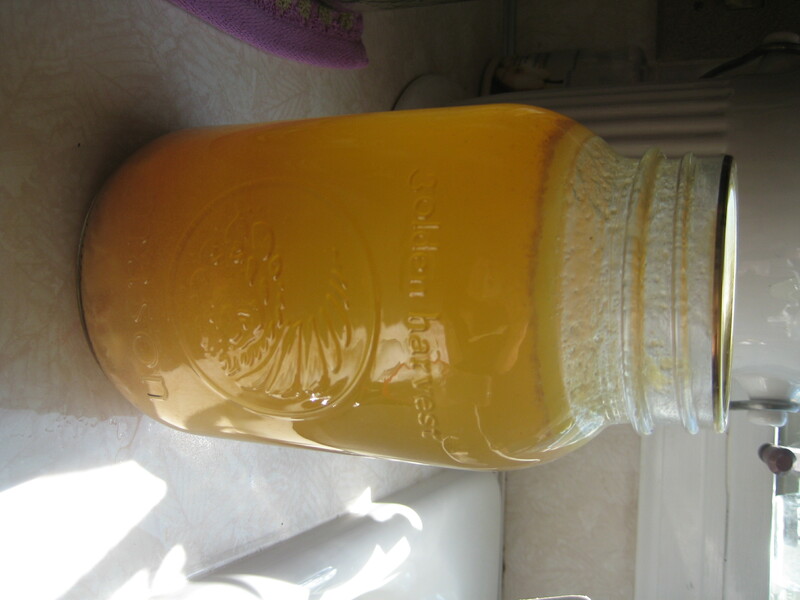 You could also eliminate the carrots and chicken broth and can it in a water-boiling canner, processing quarts for 40 minutes and pints for 35. 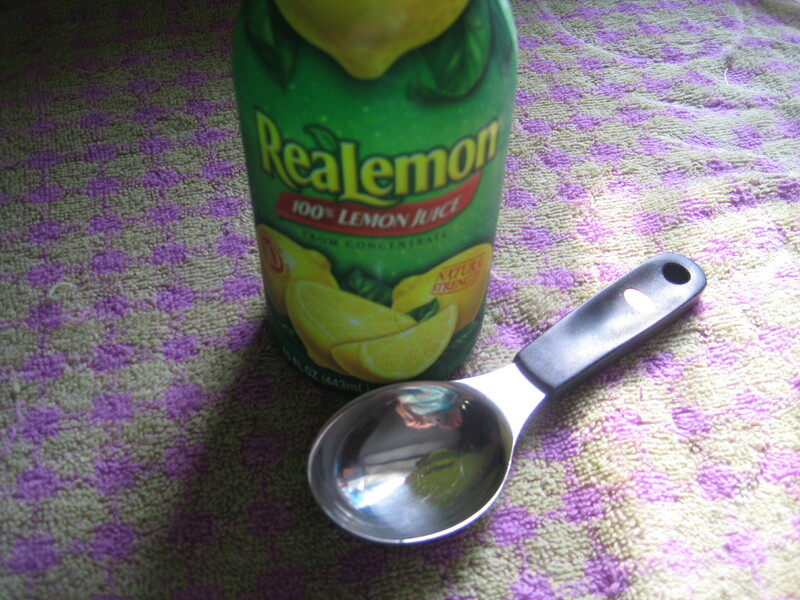 Either way, pressure-canned or water-boiled, you do need to add 2 Tbsp to quarts and 1 Tbsp to pints of bottled lemon juice (fresh squeezed lemon juice doesn’t contain the appropriate amount of acidity). 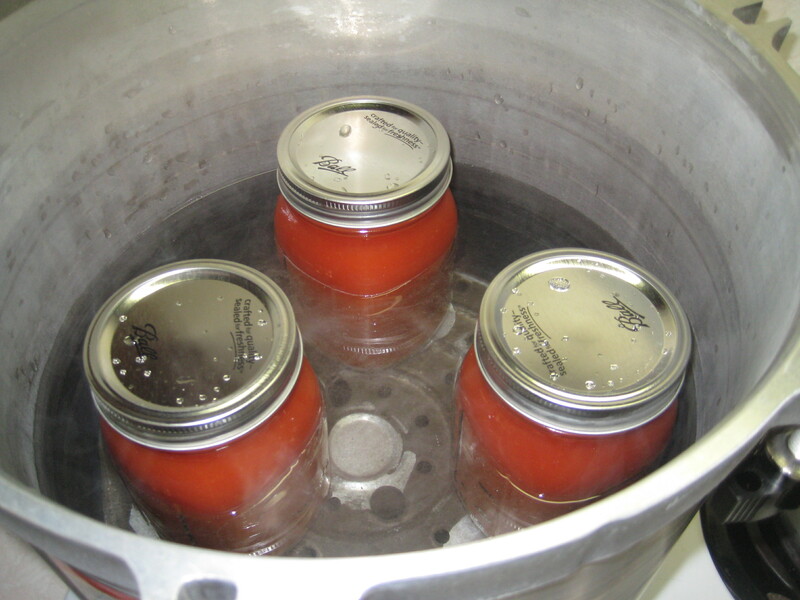 If canning is not for you, you can always freeze it! 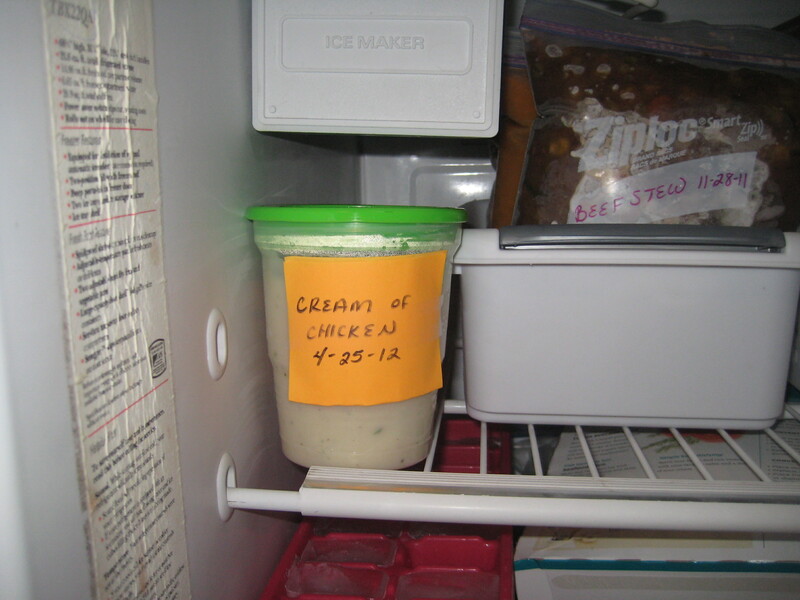 I ended up adding the cream to mine and freezing it, because as a life-long yo-yo dieter I just don’t make a habit of keeping cream in the house, so I wanted to use it all before it a) went bad or b) tempted me to dip chocolate chip cookies in it.